Below you will find my reviews and recommended ATV broadcast and seed spreaders. The chart lists out each model by brand and features to help you make the most informed buying decision. When you reference an ATV spreader then, you may be specifically referring to a seed spreader, a fertilizer spreader or even a broadcast spreader. An ATV drop spreader is yet another kind of spreader and is different than a broadcast spreader in its distribution of materials. 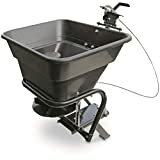 The drop spreader, as the name suggests, drops the lawn substance between the spreader’s wheels while a broadcast spreader distributes weed killer, fertilizer or seeds over a large expense, from both the front and sides of the equipment in the form of an arc. An ATV seed spreader covers a larger area in a quicker amount of time while an ATV drop spreader features a precision application that is slower in output and speed. As a result, a drop seed spreader allows the operator to have more control over the area of the yard or garden where he wishes to apply the lawn care materials. For example, using the drop spreader will help you avoid mistakenly planting grass seed in an adjacent flowerbed. Because the drop spreader limits seed distribution, make sure you overlap the wheel marks in the grass when you are using the equipment. Always add lawn care materials to a spreader when it is sitting on concrete versus a grassy area to prevent spillage of too much of the product on a single area. Otherwise, you can damage the lawn. An ATV spreader or pull behind spreader is designed to cover a large area of ground as it is constructed to be pulled by either a tractor or an all-terrain vehicle (ATV). The equipment is a size larger than push unit styles. Resilience – make sure the cart’s frame is durable enough to handle the spreader weight without signs of buckling. Ease of Operation – The seeder should be made so that seeds can easily flow though the equipment. Hopper Durability – The hopper should be made with a resin or plastic that can withstand the weight of the seed that it holds. Easy Hook-up – The spreader should be designed so it can be easily hooked up to an ATV or tractor. Ease of Maneuverability – The spreader should be built for easy maneuverability. In other words, you should be able to pull the conveyance without any difficulty. Wide Tires with Lawn-Friendly Treads – The tires should be wide enough to hold the seed without leaving deep tire impressions on the ground’s surface. By keeping those basic amenities in mind, you can better decide on what type of spreader to eventually buy. This pull behind spreader is a good choice for anyone who needs a spreader for a large residential yard. The Ev-N-Spred three-hole drop system of this spreader ensures an equal distribution of granular material or grass seed. The pull behind spreader, which features a spreading width of up to 12 feet, comes with two 13-inch pneumatic tires and load capacity of 100 pounds. The approximately 25-pound ATV spreader is sturdy, given its anti-corrosive steel frame. The hopper screen on the device efficiently breaks down clumps of fertilizer material while the flow control handle is calibrated to permit varying spread widths up to the already mentioned 12 feet. If you need a high-quality type spreader but do not require the additional “bells and whistles”, then his spreader is made for you. Expect to pay around $200 for this high-quality brand spreader. Another top selection, the Agri-fab brand model 45-0463 SmartSPREADER is one of Agri-fab’s Smart series designs. The spreader can hold as much as 130 pounds of grass seed, fertilizers or herbicides. The user-friendly knob provides a precision application while the spring on/off lever enables better operator control. The spreader’s extra large capacity cuts down on refill time. A third top selection, the AS-40BH Tow Behind Aerator and Spreader by Brinly makes it possible for gardeners and landscapers to easily spread grass seed or fertilizer and aerate the soil at the same time. The heavy duty steel hopper on the device can hold as much as 20 pounds of seed or granular material. Because of the spreader’s sizable capacity, the tow behind requires fewer refills. The galvanized tine stars on the spreader not only inhibit rust but can penetrate compacted soil up to two inches. When making a purchase decision for a spreader, you will also need to ask the following questions before making a final purchase. What part of the yard will the spreader be used? Is the spreader designed to be rust-resistant? What materials will be broadcast? What do other customers have to say about the equipment? Making an informed decision means doing a bit of due diligence online. Answer the above questions to help you decide on a spreader as well. Read the customer testimonials on the Amazon. Make sure you buy a spreader that specifically meets your landscaping and gardening needs. Durable, rustproof poly hopper has 100 lb capacity. Ideal for farming, hunting, landscaping, or grounds maintenance. 12V motor is mounted inside the hopper to stay protected while in use. Distributes free flowing materials such as seed, feed, and fertilizer. Heavy-duty 12-volt motor, easy on/off lid, abrasion-resistant deflection shield-now 60% larger!